Stuart® announces the SI505, a combined incubator shaker specially designed to reduce sample evaporation and provide fast, optimised mixing of very small sample volumes in microtitre plates and microfuge tubes. The chamber of the Stuart® SI505 can accommodate up to four standard microtitre or deep-well plates, or two racks holding 0.2, 0.5 or 1.5ml micro tubes. The high speed orbital shaking action is ideal for effective mixing of samples in even the smallest vessels, while a state-of-the-art microprocessor enables accurate, reproducible control of temperature between ambient +7°C and 60°C. The versatile integrated timer can be set from 1 second to 9 days. Removable water reservoirs increase the humidity in the chamber of the SI505, minimising sample loss due to evaporation. Tests have shown that at 78% humidity, samples incubated at 37°C for 24 hours in lidded microtitre plates lost on average only 6% of the total sample to evaporation, based on a 200µl sample in each well. The warm air feed from above also prevents condensation of sample on the lid, eliminating the risk of light scattering by liquid droplets when the plate is to be read in a plate reader. The new compact benchtop SI505 shares several proven features with the unrivalled Stuart® SI500 shaking incubator. 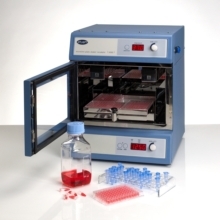 A retractable stainless steel platform provides easy access to samples, a digital display shows the independently controlled temperature and speed, and USB connectivity allows long-term monitoring of the incubator temperature via a PC. As with all Stuart® equipment, the outer casework of the SI505 incorporates BioCote® antimicrobial technology as standard, to minimise microbial contamination.